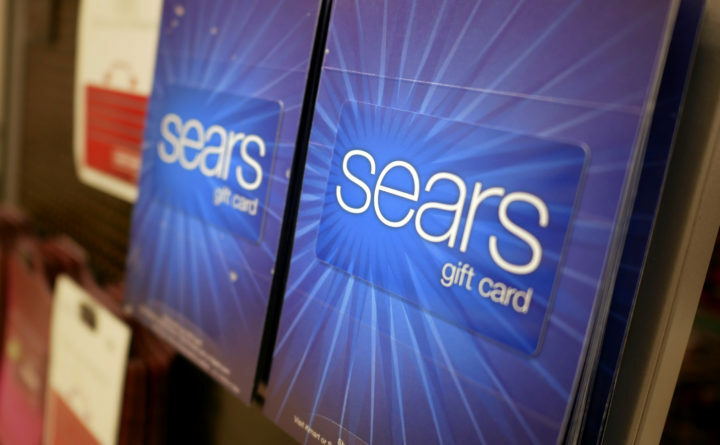 Sears gift cards are displayed at a store in Hackensack, New Jersey, Oct. 15, 2018. Sears may have filed for bankruptcy, but it’s still positioning itself as a holiday shopping destination. Even as the 125-year-old retailer continues to search for a loan to stave off liquidation, it’s stocking its shelves even fuller than in previous holidays seasons in a bid to entice customers who might not even realize it’s still operating. “We are leaning into the holiday and we intend to win this season,” said Peter Boutros, the chief brand officer for Sears and Kmart. The department store, which filed for bankruptcy on Oct. 15, said in the filings that it plans to close 142 stores and focus on operating the remaining ones well during the holiday season, which is when retailers make the most money. If stores can’t make money during the critical Christmas period — especially with consumer confidence and spending through the roof — they don’t have much chance of doing well post-holiday, either. That makes this a make-or-break time for Sears, which is working hard to make sure customers don’t equate “bankrupt” with “closed.” A banner on the Sears and Kmart websites reads “We’re Open to Serve You” — a bid by the company to reassure shoppers. Fellow retailer Toys “R” Us recently tried to reorganize in bankruptcy, but failed, and it was criticized for doing too little to convince shoppers it would survive. Sears actually saw a boost in sales in recent weeks, said Boutros, who is also president of the Kenmore and DieHard brands. A company lawyer also told a judge last week that Sears was doing better than expected and doesn’t have “a significant liquidity need right now” after the company postponed plans to finalize the second piece of the bankruptcy loan. “When we announced Chapter 11, we had a significant bump in sales and store traffic,” Boutros said. In particular, Kmart has seen an increase in toy sales since the demise of Toys “R” Us, Boutros said, especially from existing customers adding toys to their shopping baskets. Kmart plans to build on that with a new toy catalog, which it will distribute beyond its stores. Investors and vendors haven’t shown the same confidence, however. The stock’s value has fallen by about 50 percent in the second half of October as Chairman Edward Lampert seeks a partner to help provide $300 million of financing to supplement an initial loan of the same amount. Some merchandise suppliers have balked at shipping to the company due to uncertainty on its ability to get financing. Whirlpool, its biggest trade creditor, is among vendors that requested the return of goods shipped recently, a not-uncommon move for suppliers to make from bankrupt partners. The appliance maker stopped selling its own brands to Sears last year, but still supplies it with Kenmore-label goods. Boutros, a former Disney executive who’s been at Sears almost three years, said Whirlpool and other vendors are now on board. Whirlpool had requested the return of goods shipped to Sears in the 45 days leading up to its bankruptcy, according to an Oct. 25 letter. Whirlpool did not immediately respond to requests for comment about its business with Sears. In the toy category, Boutros said he expects brands like Barbie, Hot Wheels and Disney to be top sellers at Kmart, along with Adam Levine and Jaclyn Smith clothing. At Sears, the company is highlighting a $150 320-piece Craftsman tool set and a new Kenmore refrigerator with an Amazon Dash button built in, along with a new line of Kenmore-brand cookware. The company’s fight to survive is bringing out the best of its employees, Boutros said. “It was fascinating to see the jolt that Chapter 11 did to our culture,” he said.